We believe that quality of life is important for our Hematology Oncology fellows. 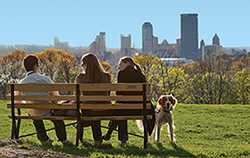 Pittsburgh is a vibrant city, offering affordable living, distinctive neighborhoods, and an abundance of leisure activities. Located where the Allegheny and Monongahela Rivers form the Ohio River, Pittsburgh boasts a population of more than 2.6 million and combines the amenities of a large city with the friendly feel of a small town. Safe neighborhoods, excellent restaurants and clubs, and an exciting art and music scene make Pittsburgh a great place to work and play. Pittsburgh has undergone a striking renaissance from a down-and-out smokestack to a gleaming cultural oasis. There are great restaurants, excellent shopping, breakthrough galleries, and prestigious museums. Food, sports, music, and the arts – you’ll find it all in Pittsburgh, and more! Here are a few Web links to get you started. Learn more about relocating to Pittsburgh for our fellowship program.